Paradigm Shifts, Incrementalism, or Both? The idea of a paradigm shift was initially presented in Thomas Kuhns influential book The Structure of Scientific Revolutions (1962). Kuhn used this conceptthe creation of a new world-viewto explain how scientific progress develops, specifically in the physical sciences. But does this concept also apply to the biological sciences? Noted geneticist and science historian Elof Carlson explores this question in this book. Carlson had originally posed this question to Kuhn in the early 1970s, asking why paradigm shifts were rare or nonexistent in the life sciences. Kuhnâ€™s response was that the physical sciences depended more on theory than biology did and that biology was largely descriptive. How Scientific Progress Occurs: Incrementalism and the Life Sciences examines how progress in the life sciences occurs. Detailed narratives of the development of the fields of, for example, cell theory, gene theory, mutation, evolution, and several others are presented as evidence. And because of the interconnection of the life sciences, cognate fields and shared tools that they may use are also considered. 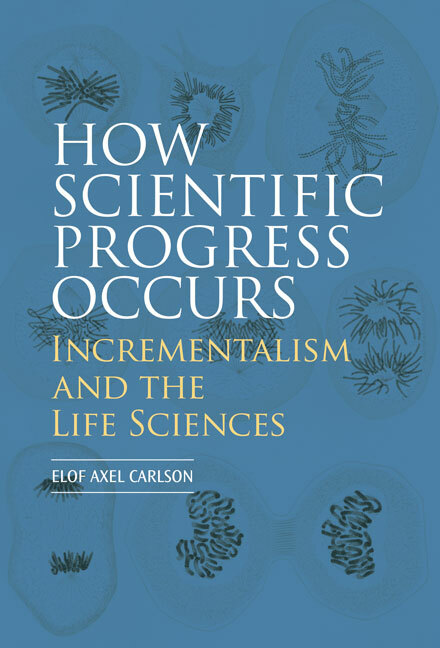 Carlson concludes that progress in the life sciences occurs by a process that he calls incrementalism, which is analogous to Kuhns normal sciencebut in Carlsons view is raised to a more significant level. As he states in this book, Scientists are not solving a jigsaw puzzle. Most of the time they have no idea where innovation will lead and the paradigm, if it exists, is a constantly changing one, not a photograph on a box propped up on the table for us to look at. This insightful journey exploring progress in the life sciences will appeal to historians of science, student, and working scientists, as well as philosophers of science. 1 Paradigm Shifts, Incrementalism, or Both? 13 How Does Science Usually Work?